Glocksman, ElmoH and I got together at Elmo’s place earlier tonight along with the elusive (and camera shy)as of yet UN-Ars registered buddy known online as “Innuendo”. Our task was to upgrade and Network Elmo’s PCs (one we built for his brother Danny). I thought it would be fun to document some of this in pictures & as luck would have it Innuendo had a Fuji Digital Camera. So he took all the pics. One thing I wanted do was a “LoneGunmen” style pic with me in the middle and ElmoH & Glocksman with their backs to me. 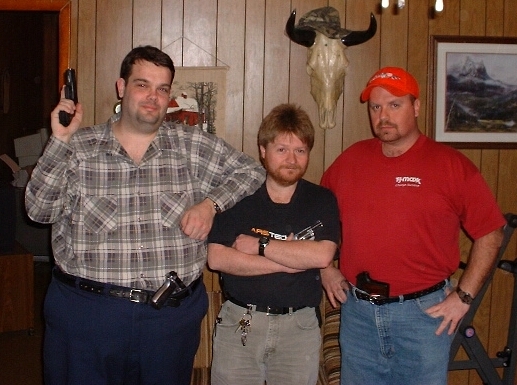 Here we are…from left to right: Glocksman, WebHobbit & ElmoH. Innuendo thought it looked more like “the LoneGeekmen”! LOL! Elmo assembled a crack team for tonight’s mission. Heh,heh…I look like a little kid here! 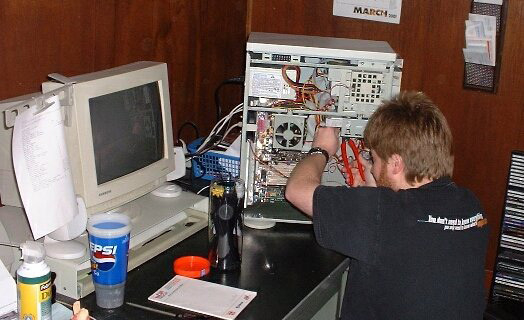 Here I am getting ready to install an Intel NIC in Elmo’s brother Danny’s PC. Here’s Glocksman aiming his Glock. I think he looks kinda smart with the glasses. Here I am zip tying some wires up in Elmo’s Addtronics case. I just LOVE wire-ties. And here I am cutting off the ends. You gotta keep it tidy! I HATE when people leave the ends of zip ties hanging out. Here’s ElmoH and Glocksman changing out the Video Card. Glocksman is holding the old CPU (a Celeron 466) and the old videocard (a Voodoo something). ElmoH upgraded to a Slot One P-3 850 and a GeForce2 GTS. Here is ElmoH the true High-Tech Red-Neck! He’s holding a P-3 slot one CPU in one hand and a Brass Spitoon in the other. LOL!